There is nothing better than finding a wonderful review about Hypnobabies on a Mom’s Blog! So, my review is 5 stars!!! Seriously, Hypnobabies is wonderful and made my pregnancy so much more enjoyable. I was able to take some time every single day to relax and I felt so much more prepared for this birth. During labor Hypnobabies helped me remain calm and focused. 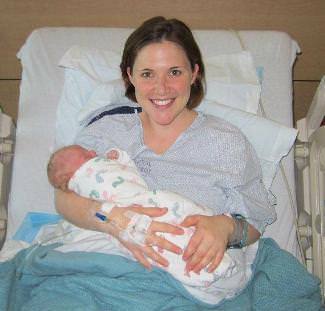 I had a very speedy, relatively easy birth that was almost exactly how I had envisioned it. If anyone ends up going the Hypnobabies route I would STRONGLY suggest purchasing the extra After Your Baby Comes track. As much as I loved using it during my pregnancy and during labor and delivery, I loved it even more afterward! I listened to this track every day for the first 6 weeks after Declan was born and still listen to it occasionally. It really helped me feel more rested and confident, helped me maintain a level mood through the postpartum hormone changes and just really helped my recovery overall. I loved my experience with Hypnobabies, would recommend it to anyone wanting an easier birth and will definitely use it with any subsequent pregnancies. P.S. One of the suggestions Hypnobabies provides is that you visualize exactly how you want your birth to go. I wanted to have had a good amount of sleep, but still wanted to go into labor when it was dark and quiet and while Aaron was asleep, I also wanted to get to the hospital in time to deliver but I didn’t want to be there for very long when the baby came and I didn’t want to push for very long. All of these things happened! Go over to Aubrey’s Blog to read the whole review! Her birth story is there too! So glad you enjoyed my post! I absolutely loved my Hypnobabies journey and would highly recommend Hypnobabies to expectant Moms!